Silver margin requirements raised leading a large selloff in /Si today. SLV seems to find support at the 20ema. – Watchlist taken from Option Addict. Add to CME when MAR-11 340 CALL premium drops to 4.00. Tech: TL support. Look for support at 200 ema and wait for stochastics to turn. Tech: Strong channel and stochastics about to turn up. Timing: Start entering on Tuesday. Tech: Look for ICE to tag the 200 ema. Timing: Mid-week. Anticipating a bit more downside. Tech: Watch for stochastics to turn up. Tech: Waiting for oversold levels and TL retracement. Timing: Later in the week. Started position on 1/31/10 and am looking to add if there is no breakdown. 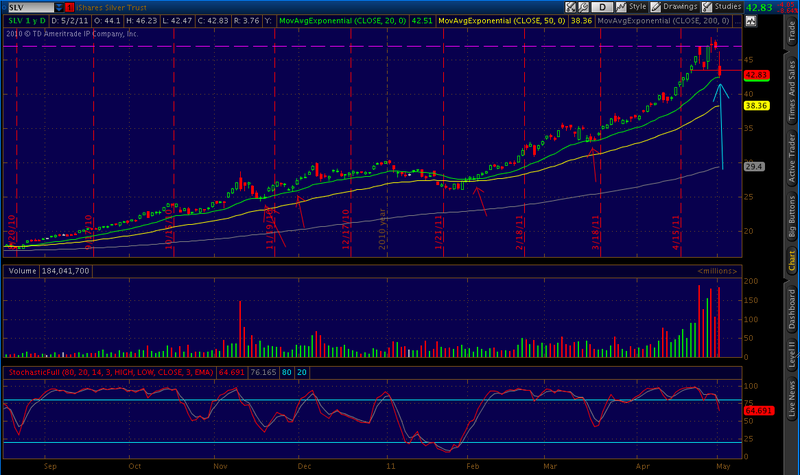 The stochastics are turning up and the underlying has been resting on the upward TL for 6 days. It’s holding the 50 ema with strength as well. Will look for an entry when the stochastics pull back more. Probably Wednesday. I am anticipating a continued move this week. Looking to enter this in the morning on Monday. This is a common breakout pattern called a falling wedge. I have found that sometimes it takes a while to play out but when it does, the move can be explosive. This is another stock that will have an entry midweek although a small scale in on Monday or Tuesday would be a good idea. Will look at adding to my position at the intersecting point of the TL and 50 ema. Mental stop set below support levels of around 63. Nice trending channel. Will continue to watch this trade play out. Looking for a break up to 60. LVS has great price movement. Good entries tend to be on support levels such as the 20ema or the 50ema. A stop on this trade would be below the 50ema. There is a resistance point going back from 5/10 that has been broken here. It is likely that there will be a continuation up if we see a break above the 50ema. Started a position and will hold with patience. This is a weekly review of positions entered. It is important to look back on the trades you’ve made especially if they are bad. Here are 3 entries I am looking back on.